Nicole's Needlework: My Class Kit Arrived!!! 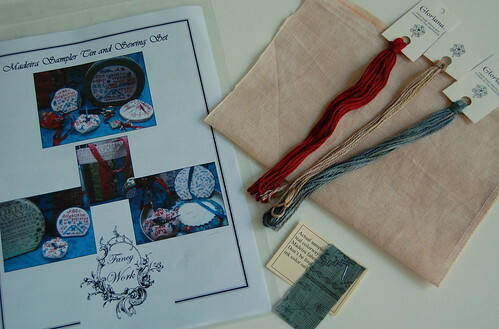 I was so excited to open the mailbox yesterday and see a package from Jane Timmers. It was the chart, fabric and threads for the Madeira Tin Project to do the pre-stitching for the class. 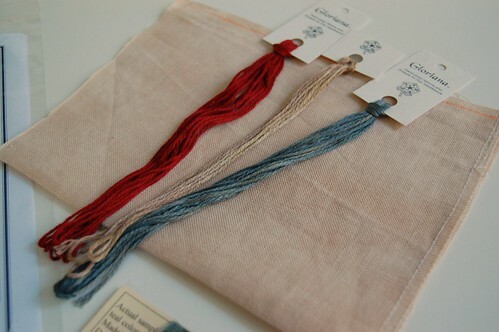 The fabric (Vintage Light Examplar by Lakeside Linens) and the silk threads (Gloriana) are just gorgeous!! Oh my, the colors are gorgeous. Have fun stitching this piece. how pretty!!!! Can't wait to see your progress...you are such a fast stitcher, you will be done in no time!! I bet you are so excited about this upcoming class! This is a really pretty pattern and I love the threads and fabric for it! LOVE the combination of fibers! Enjoy your prework! Can't wait to see the finished project! I bookmark your blog in Google Reader so I will always know when you have a new entry - I check it every day - I love to see everything you are doing! You do beautiful work! I was excited to see your post today - I have my Madeira Tin in anticipation of a class with Jane in the fall of 2009 here in Texas! So I can't wait to see your progress & finish on this project!!! I will be anxious to hear what your comments are. . . I envy you US girls with such lovely classes to attend! The fabric and floss are gorgeous colours and I can't wait to see your WIP. How pretty! The threads and the fabric look gorgeous! Love it! My guild is offering this class next Fall. I am looking forward to it!